Teaching for Ecojustice: Curriculum and Lessons for Secondary and College Classrooms -- Welcome! 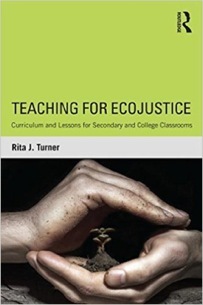 This is the author's website for Teaching for EcoJustice: Curriculum and Lessons for Secondary and College Classrooms by Rita J. Turner. Teaching for EcoJustice: Curriculum and Lessons for Secondary and College Classrooms is a unique resource for exploring the social roots of environmental problems in humanities-based educational settings and a curriculum guidebook for putting EcoJustice Education into practice. It provides model curriculum materials that apply the principles of EcoJustice Education, giving pre- and in-service teachers the ability to review examples of specific secondary and post-secondary classroom assignments, lessons, discussion prompts, and strategies that encourage students to think critically about how modern problems of sustainability and environmental destruction have developed, their root causes, and how they can be addressed. The author describes instructional methods she uses when teaching each lesson and shares insights from evaluations of the materials in her classroom and by other teachers. Interspersed between lessons is commentary about the rationale behind the materials and observations about their effect on students. In the Materials for the Lessons tab you’ll find a list of the materials I assign for each lesson described in the book. Below some of the items in the list you’ll find links to websites – these websites either contain the exact materials I assign in my lessons, or they may contain related material that you may be able to substitute for the texts I assign. I include notes about the links as necessary. In the Slideshows tab you’ll find slideshows I use in my own classroom for some of the lessons, as mentioned in the book. In the Standards tab you’ll find a list of Common Core Standards that are fulfilled by each lesson. Resources provides links to other relevant sites you may find useful. Click the link on the right to buy the book!